How Can Trinity Help You? Hello, my name is Cory Minter and I’m here with Ethan may were with Trinity Employment specialists and we’re a staffing firm. 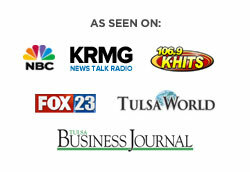 We’re located here in Tulsa, Oklahoma. We’ve been in business for 10 years now, over 10 years. We’ve been in inc magazine and won a lot of awards and one of the things that we are passionate about is helping people find the right position. And for me personally, this is a personal thing, ethan, but I want to help. I want to help people find where God wants them to be and be a real true, uh, uh, advocate for the candidate and, and be able to help companies match with a players. That’s what our thing is. I, I, I tried to begin calling ourselves to a player matchmakers, but I got some kickback from our staff. They, they, they’re like, it doesn’t look right now. They’re just jealous. Will say that man, there’s jealous they’re not on the show with us. That jealousy. That’s got be right. And so today what we’re talking about, I think is a, I think it’s a great topic because of the power that in the workforce that staffing firms are now and then how it’s growing. And so I want to talk to our employees about how to properly use a staffing firm and that staffing firm that you use might not be us. And we want to talk about how you determine that and how to pick the right staffing firm and how just how to go about using staffing firms as a resource. You know, and so we, we ethan’s got some great stats, but before we jump into that, you know, you always want to get systems working for you. It’s really important that you do this. So one of your systems pretty clear and obvious that you want to get working for you is you’re going to want to get some of these job websites going. And so everybody knows this. You’ve got indeed, Ziprecruiter, glassdoor, and linkedin. Those are probably the top four. But you want to get these websites working for you and sending you the right kind of jobs. You know, one of the things I learned when I went and met all the developers of these websites is filling your profile out completely on there. It makes you much more searchable. There’s some, there’s all these different things that you can do to get these systems working for you. So think about it, that job platform or that job website, it’s like an employee. You go get it working for you. So when you’re not doing your job search, it’s actually working for you in the background. Okay? A second way is to get staffing firms working for you and you know, I recommend that you use probably to, CNC Machinist, you know, uh, from a, from a financial standpoint, any a player we only want them using, that’s a personal. I’m trying to be authentic with you on how you can best use a staffing firm is use a couple of years, a couple of the top people that you’re able to find. We’re going to help you be able to pick the right staffing firm at the end of this and our action items, but get staffing firms working for you. We’re going to talk about how you can go about doing that and the importance of it, but first tell us a little bit about the staffing industry. Yeah, man. So the staffing industry is something that CNC Machinist, I mean it’s doing nothing but growing. I mean it’s just growing, growing, growing. A recent stat shows that in the US workforce, a yearly staffing, recruiting workplace, Workforce Solution Industry, I mean they staff more than 15 million employees a year and the year in the US, I mean 15 million employees in America are only staffed because they went through a staffing company and if you, if you study employment and staffing and all this is what you’re going to learn every. Not everything that I hate using the word everything, but oh, they are saying there is a huge increase. It’s going to be happening in the GIG economy and staffing firms are going to be at the forefront of that. I’m most likely this industry is going to grow. Of course, the course on the staffing golf course. I’m going to say that, but go read. They’re saying that it’s, that it’s getting ready to grow a pretty greatly, but it’s really important to be able to, even as an employer, to understand the, the importance of high level recruiting. We have some stats here that talk about high level recruiting and why it’s so important. And the thing is, when I, when I started googling this, we have some of the best quotes of any of these. We do a podcast, we do three a week and we’ve got some of the best quotes of any of them that we’ve done so far. CNC Machinist, you know, read your favorite. Oh boy. My favorite. It’s anonymous, anonymous. We can’t find out who says, but it’s a quote I’ve seen all over the place and I see it again here. If you hit the quote is this, if you think hiring professionals is expensive, try hiring amateurs. And boy is it true you get so many people who are like, man, I don’t want to spend a lot of money hiring, you know, I want to pay him cheap. I want pam cheap. And then they get upset when these, you know, low end being low pay and candidates come in as amateurs. They’re not doing a good job and they have a lot of turnover. They have to hire all these new people. Well, we’ll give you one good reason why they’re not hiring professionals. You’re not hiring the good people. What? One of the things that trinity tries to do is put quality over quantity every time. It’s hard to do because sometimes you’re not profitable in the short term. We’re really going after a longterm. So I really liked this quote and it was from, I don’t know, when aristotle lived, you’re, you’re the, you’re the guy of useless information. What time period of aristotle lived? Do you know? Oh boy. Aristotle was living in the early hundreds at some point. I can’t remember. Honestly. I’m actually surprised this guy right here knows a lot of weird information that most people don’t know, but I want to it to this day. I get to the step dog in this ear. And quality is not an act. It’s a habit and I’m hiring the right people. It’s really important that the other, the other quote that I liked is from Steve Jobs and you know, a lot of histories come out with Steve Jobs. Some people really love him and some people thought he was, you know, but we love his products, but this is how I got it. He said the way to my success is that we have gone to exceptional links to hire the best people in the world. And that, in my opinion is what staffing firms are all about. We want to help our customers find a players and only find a players and we want to help a players get connected to the right companies. And that’s what we want to do. What’s, uh, what’s the other quotes? I want to go over these. I mean, let’s do one more. I loved them. Yeah. No, I love him as well. CNC Machinist, another really great one by Peter Schulz is higher character trained skill and I love that one. I mean, you can train skill, you can train people in little areas. Maybe they don’t have experience in, but you can’t train someone to. You can’t train character, can’t train better people. Yeah. There was a, there was an article that I read, CNC Machinist, it was probably two or three years ago and it came out of the Harvard Business Review and I started reading it at the airport in this magazine was like $25 and my plane was getting ready to take off and I’ve never in my lifetime spent $25 on a Daggum magazine. Spent $25 on a magazine, the articles that I was reading it in, you know, how you go in the bookstore at the airport. And I was like, this is so good. And Man, it, it really changed our business. We started doing that. We started hiring people and training the skill and that was something they were talking about was going to be a thing of the future. And I’m now, you know, three or four years later, CNC Machinist, you hear a lot of top level companies talking about this and how to do it. CNC Machinist, but, uh, so we need to get to our, CNC Machinist to our action items here so we can, so we can get wrapped up with what these are. It’s how, if you’re an employee, how to, how to find the right staffing firm. And so the very first one is to pick the right staffing firm talk. Talk to us about that a little bit, Ethan, from your perspective. So I mean every, every staffing firm, you know, does some things. Well, some things not super well. CNC Machinist, we, I just think that remember we are currently working in the industrial field. We’re doing a lot of staffing for, I mean everything from welders, machinists to draftsman to all in all this. But we started the company just doing medical staffing and there was a guy that come in and he was looking for a job welding and at the time we weren’t staffing for welders. We hadn’t really dove into the industrial field. And we said, oh, sorry, you know, we don’t. I resisted it for a long time. It was a big mistake. It was a big mistake. I’m so sorry. Oh, it’s okay. But you know, that’s what we told me, said, hey, sorry, we don’t really do much staffing in that field, but here are a couple of different staffing firms that do and we directed him towards people that’s specifically work in the industrial field. So I picking the right staffing firm, I’m just kind of, you know, the base level is finding something somewhere that works specifically with what you do or what you want to do. Yeah. And just real quick and specific, I want to tell you one of the main ways that you can check, go onto their, onto their website and find out what jobs are recruiting for now. If they’re recruiting for a number of jobs that are in your industry and close to what it is that you’re looking for, that’s likely a good, uh, a good staffing firm for you. I really think it’s important that you go to google reviews, you can go to glass door, there’s all sorts of different places that you can go for reviews and CNC Machinist, you need to find out what people are saying about the staffing firm. Listen there in our industry there, there are some really great staffing firms in this town, I promise you there are, but there are some also some staffing firms that put making money over the overtreating the candidate properly and in our industry I think it really crushes the public perception of staffing and it’s not that I hate them, understand, understand what they’re trying to do, they’re trying to make a buck, but umCNC Machinist but you need to go and see how they treat people. I think that’s a very important thing to do. So find out that they’re in your field and then how they treat people. Like those are a couple of things that are really helped you to pick the right staffing firm and try to find at least two. Yeah, yeah, I agree. Second thing, ask questions. What do you want to ask Ethan? I mean, if you never worked for a staffing firm, you’re probably kind of confused about how the process works. I get that all the time in my interviews. I ask every person to interview as well. Have you ever worked with a staffing firm before? Um, I think if you never have, it’s easy to walk in and be confused. It’s easy to walk in and be a little intimidated, not sure what’s going to happen, not sure how the process goes, not sure if it’s, I’m just going to cost you anything. So, you know, sometimes I’m in the, in the eighties and nineties when staffing got big, that was a lot more prevailing. You had to pay like a finder’s fee to these staffing firms, which, which I think stemming from as quickly realized if you’re looking for a job, you probably don’t have the money to pay us, you know, so, um, most, if not almost all staffing firms don’t charge, but good questions to ask, you know, you should go over, you should ask how the process works, what, what it means or what it looks like to follow up with your recruiter or if they’re going to follow up with you and what they prefer, what they preferred. You prefer me to follow up with you? Do you prefer me to call you? Email you? Do you want to reach out to me? Um, I mean, you gotta remember your staffing firm once you to succeed, they want you to get a job because they, they want to stop you. That’s what they’re there for. So don’t be afraid to ask those questions to make sure you’re understanding how the process works, what they expect from you. If there’s anything more that you can do, um, treat the interview seriously. Listen, because I used to interview and then now, now I don’t interview any longer, but this is the one thing. And Ethan, I want you to comment on this real quick. I had some people that most of them you know, who had just lost their job and they’re pretty confident that they were going to be able to find something really quickly and they came in with an a level of arrogance that, listen, I’m above this process now. Now listen, of course off felt that frustrated me as the interviewer, but this is what I knew and I want you to know this is our listener. Some of those people that came in there, I purposely did not send them out to places because honestly I didn’t want to deal with them. I didn’t want them on our payroll. CNC Machinist, they, they had an arrogance to him. I knew they were going to be a problem to deal with and the level of arrogance that they came in with. I was like, man, I can’t imagine how they’re going to treat people. And so this is what you need to know about staffing firms. Many times the largest organizations in town only gave us the job order. We have some of the largest places in town. They don’t even, they don’t post it out, they don’t, they don’t want to go through the interviewing process. And so they hire us to screen people for them and sometimes just write down and I later found out where they had to go to work and I was like, man, if you were to just treated me properly, yeah, I would have hooked you up and your qualifications, we’re going to give you a really great shot at that job. You, you need to treat your recruiter well because a lot of times just making the recommendation on a weekly basis where we are creating job orders, creating when we get the right person that we like, we go to managers and create jobs and so you’re, you’re, you’re hearing me get a little bit passionate about it, but it’s unfortunate when we have some people and I know that you get treated this way because I know I did. Yeah. And you have people that come in and they are just disrespectful to you as though they are greater than it and you know how many jobs you created this year alone just by your reputation. Sure. And what people don’t understand when they come into these interviews. A lot of times I had someone tell me specifically, they came in wearing shorts and a tee shirt. I was like, thanks for coming in today. And they said, yeah. Honestly, I almost didn’t want. I found out this was a staffing firm. I didn’t want to waste my time because they felt that they were too good for that process. But then I got them a job and uh, and they realized they weren’t too good for the process. You know, when you got to realize is that interview with the recruiter, with the staffing firm. It’s not just some hoops you have to jump through. That is the first interview. That is a first round of interviews for that job that you’re looking for. That’s important. And the very last thing I’ll say is I just remembered aristotle was in, I think he was in the three hundreds BC. He was BC. I remember that. I don’t think it was BC. Three hundreds. BC, I could be wrong. I think he died somewhere around 350 BC. I don’t know anyone. No one I’m talking about here. I promise you I’ve been sitting in front of him. He didn’t get out his phone and start digging this up. I think it was 300 around 350 BC. I just keep you on that. So weird. The next thing is, um, you know, I mentioned it earlier, is to be really honest and be authentic. CNC Machinist, a lot of times your recruiter can be your advocate that can help you overcome the different things that are around and so you can use them as your advocate. I think it’s really, really important that you do that. The next thing is be open minded. A lot of times I’m telling you, I’ve created jobs. In fact, um, our salesperson is one of the best salespeople I’ve ever worked with. I love working with her. Um, and she came in and was interviewing for a front desk receptionist that was going to make way less than what she has the opportunity to make with us and I just saw potential enter. But the thing is, is she was openminded and was open to thinking about this as a Jew in, in man in my glass. She’s been crushing it, man. Am I glad that, uh, that I met her that day. Be Open minded to new opportunities, take advantage of the free services. Many staffing firms offer courses and trainings. I mean, that’s Kinda what we’re doing right now. So, um, you know, look at their websites and use some of the information that we give out and I’ll tell you what, because this is our industry and it’s what we do. It’s a great opportunity for you to gain information on how to be extraordinary at interviews. And the last thing I want to bring up is don’t be afraid to say no. If you like your recruiter and they go to bat for you, but you kind of know that this isn’t the right fit for you. Please do not feel guilty and taking a job. You’re going to get that from a lot of staffing firms who have a strong commission structure and I understand why you get the wrong minded recruiter is going to push you. But listen, I, I encourage these guys everyday is the leader pleased? Do not push our people. I mean I’ve had to coach you through it actually on a, on a couple of instances to just to just make sure that you do not push somebody into doing something that they don’t want to do longterm. Yeah. Something. Yeah. Sorry. Something I’ve been, I’ve been telling all my candidates is you got to remember we’re on the same team here, so if this doesn’t sound like a fit for you, don’t be afraid to, to say no. Like I want to find you something. That’s awesome. I don’t want to place this somewhere. Like don’t be afraid to rely to speak your mind to be open and honest with. Yeah, I mean Ethan got a higher just not long ago and I think that a lot of it was because the God just trust him because he understood that he was going to just do what was best them and that when I mentioned earlier, the biggest thing that we want to do at trinity is we want to help our candidates get to a place where God wants them and it, it’s, uh, it’s really important to us that we’d do that. And then we put other people first. Listen at Trinity Employment. We would love to be able to help you. If we can, you can contact us on our website at Trinity Employment Dot Com. Or you can give us a call at nine. One, eight, six, two, two, two, five, eight, eight.